Scientists have traced Cucurbita pepo, the founding fruit of pumpkin pie, to seeds 8,000 to 10,000 years old in the Guilá Naquitz Cave in Mexico. The site is believed to have the earliest evidence of domesticated crops in North America. Though these early Mexican varieties were smaller and more bitter than the pumpkins we know, early Americans ate or otherwise used almost every part of them. By the time Christopher Columbus reached the New World in 1492, pumpkins and squashes had spread north to Canada. In 1796, Amelia Simmons of Connecticut published “American Cookery,” believed to be the first American cookbook to rely on native-grown ingredients. Despite their artery-clogging richness, the ingredients for her two “pompkin” dessert recipes—stewed pumpkin, eggs, sugar, cream, spices and dough—wouldn’t be out of place today. Then came pumpkins’ biggest transformation: into a sort of political emblem. According to Cindy Ott, author of “Pumpkin: The Curious History of an American Icon,” pumpkin pie became a symbol of the cultural war between North and South. For Northerners, particularly abolitionists, the virtually self-growing pumpkin was the antithesis of the slave-grown plantation crop. 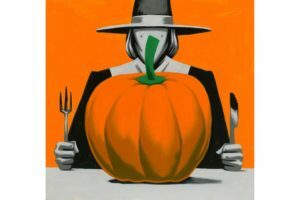 Antislavery novelists celebrated pumpkin pie, and the abolitionist Sarah Josepha Hale (1788-1879), who successfully campaigned to establish Thanksgiving, described the dish as “indispensible” for “a good and true Yankee” version of the holiday. In the South, “cartoons and illustrations…associated blacks with pumpkins as a form of derision,” Ms. Ott told the media website Mic in 2015. Today, pumpkin pie shares the holiday stage with pumpkin-spice lattes and other flavored concoctions—a craze that has now spread as far as China. Not bad for a humble gourd with global ambitions.